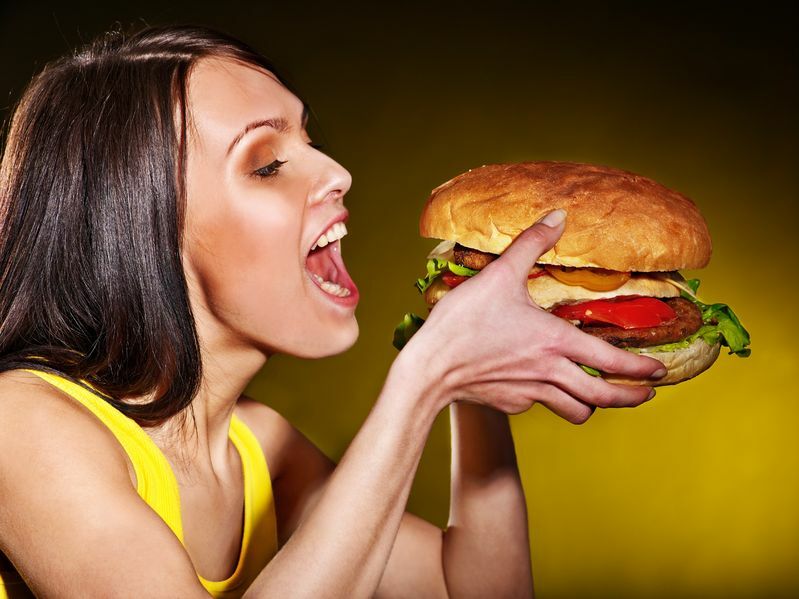 If you want to know how to use a special type of “controlled overeating” to make dieting more enjoyable and effective, then you want to read this article. For most, the beginning of a diet is an exciting moment, teeming with optimism and ecstasy. 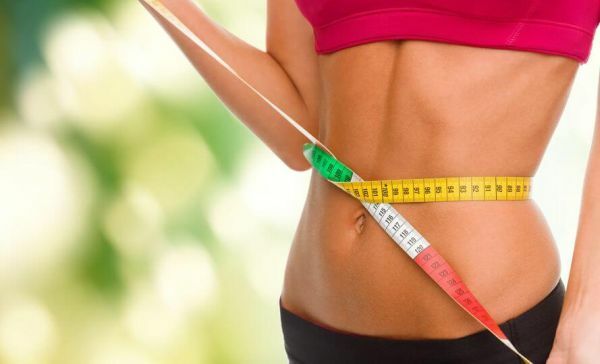 For the first couple of months, it’s usually smooth sailing: you exercise regularly and maintain a proper calorie deficit and your body fat percentage progressively declines. Eventually, though, progress slows. Your energy in the gym wanes and your workouts get harder and harder. Your goal, which seemed in the bag just a month ago, now appears further and further away. And if you’re like most people, this is where you lose heart and binge. And then binge again. And again. Instead, the “trick” is something you’ll relish: occasional overfeeding. What do you think about the refeed day? Have anything else to share? Let me know in the comments below! Increased motivation from boosted testosterone, dopamine (a hormone responsible for reward and pleasure), and leptin (a hormone responsible for satiety and metabolism). The most powerful of these effects is one that most people aren’t familiar with. It relates to leptin, which regulates hunger, your metabolic rate, appetite, motivation, and libido, as well as serving other functions in your body. The net effect of a proper refeed is you feel better both physically and psychologically, you’re much less likely to fall down the slippery slope of “just one more cheat day,” and you can even experience a nice acceleration of fat loss over the following 3 to 5 days. Nonetheless, the caveat to this is that it requires self-control. If you abuse these periods of overfeeding then you will simply gain too much fat as a result to make them effective weight loss aids. Research has shown that an all-out binge can increase your metabolism by three to 10% for merely 24 hours, but the sheer amount of calories eaten will negate this negligible increase in metabolism, making the aching-after effects of a typical binge not worth it. Fortunately, you are about to learn how to avoid these problems by strategically devising a refeed day relative to your unique metabolic makeup. First, you should determine how frequently you need a refeed day. If you are fairly lean or in the deeper phases of dieting, you are more susceptible to metabolic adaptation and mental lethargy. By cutting calories, you expend less energy, chiefly because you move less—this is referred to as adaptive thermogenesis. Thus, begin with one refeed day a week and adjust as needed. However, if you are in the early periods of dieting are still above 10% body fat (guys) or 20% (girls), start with one refeed day every 2 weeks and see how your body responds. After determining how often you should reefed, it is vital to set a caloric goal for each refeed. “Because of the scarcity and unpredictability of food in nature, humans and other animals have evolved to eat their physiological limits when food is readily available, so that excess energy can be stored in the body as a buffer against future food shortages.” –Pinel JPJ. Thus, a form of energy regulation will keep you from overindulging and help you attain the benefits associated with a refeed day. To do this, take your current daily calorie intake and increase it by 30%. This will provide enough of a surplus to confer the benefits of refeeding without adding too much body fat. Why so many carbs, you wonder? Because eating carbohydrates is the most effective way to increase leptin levels. Second to that is eating protein (high-protein meals also raise your metabolic rate). Dietary fats aren’t very effective at increasing leptin levels, and alcohol actually inhibits it. Eating a bunch of carbs has further benefits that relate to glycogen, which is a stored form of glucose responsible for fueling your workouts. While dieting, your glycogen stores progressively decline and with them your strength and muscle endurance. Acutely increasing carbohydrate intake is an easy way to fill them back up and thus improve your performance in the gym. 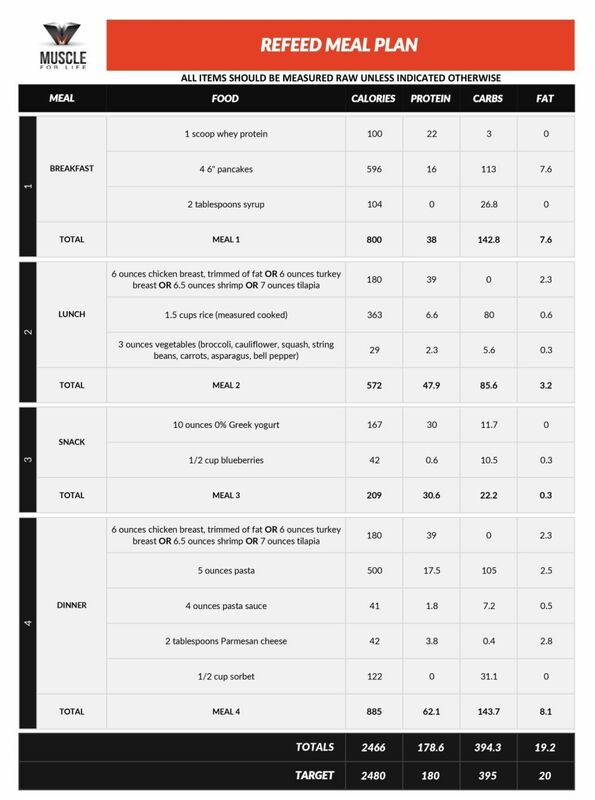 If you’re wondering how exactly how to go about planning a refeed day, here’s an example of a refeed meal plan we’ve made for our custom meal plan clients. You stick to low-fat sources of protein like lean meat, low-fat dairy, protein powder, egg whites, etc., and eat a variety of carbs with an emphasis (usually) on whole grains because of their caloric density. The refeed day is an effective way to stay on track in your dieting, avoiding the dreaded binge, and even accelerate fat loss. 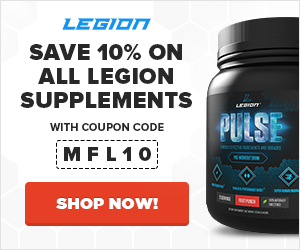 I hope that this article has granted you ideas for how to incorporate refeed days in your nutritional regimens while dieting, and how to structure them for your unique psychological and physiological disposition. If you’re not using refeed days by now—or not strategically manipulating them—now is the time to start. Perhaps you will be amazed by just how useful a refeed day can be.